How to Download ASUS AI Suite 3 and Install It? You first need to check if your product’s motherboard supports the suite. To do this, you can see if the utility is available for your exact product model. At the Download Center, enter the model name of your motherboard. In the example below, the motherboard’s model name would be PRIME X370-PRO. Once you select the OS, you’ll be able to see a list of drivers and utilities for that motherboard. Click on Expand All + to see the full list. Scroll down and look for AI Suite 3 or AI Suite III in the Utilities section. Tip: It helps if you do a CTRL + F and search for “ai suite” instead of manually scrolling and searching. Once you find the right version, click the Download button right next to it. Once you have downloaded the ZIP file, extract the contents and run the AsusSetup.exe file as Administrator. Post installation, you’ll be able to see the AI Suite 3 icon in the taskbar. Double-click to open it, then click on 5-Way Optimization and choose between the Fast and Extreme tuning options and click on Start. 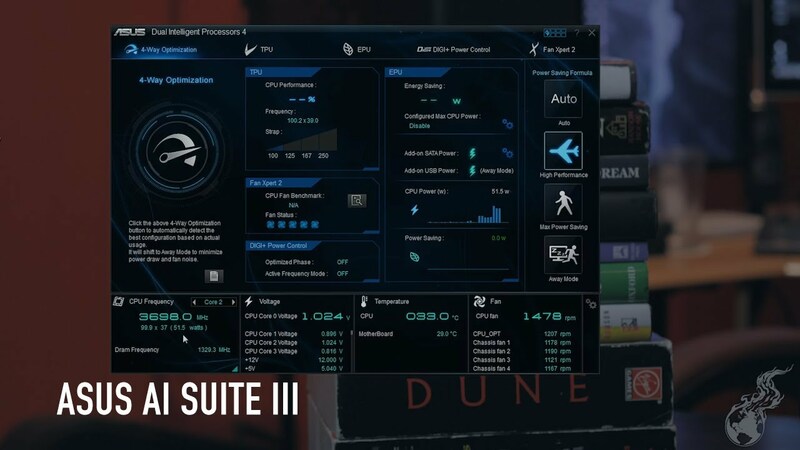 ASUS AI Suite 3 is now ready to give you CPU optimization, better power management and more control over your fan. You can either choose to leave the default settings and let the suite figure out the best things to tweak, or you can configure advanced settings to personalize your experience. There’s been an ongoing tussle between ASUS motherboard customers and Bitdefender, whose antivirus product is still incompatible with the AI Suite 3. In fact, the incompatibility issue began with ASUS AI Suite 2, but seems to remain unresolved. As of now there seems to be no workaround. Commenters in the ASUS ROG (Republic of Gamers) forum seems to have reached several stumbling blocks when attempting to install both applications. No permanent fix seems to be in sight, and the forums have been full of finger-pointing for a long time now. How to Get Rid of Persistent ASUS Services after an Uninstall? Step 2: Go to C:\ProgramFiles(x86)\ASUS\ and erase all program files and folders. Step 3: Next, run the AI3 Cleaner executable and restart your computer. You can get the .exe file from this Drive location, courtesy Raja@ASUS, Tech Marketing Manager at ASUS HQ.